A press release this week from the American Wind Energy Association announced a recent study from the Department of Energy concluding that, for an investment of about $43 billion, wind energy could provide 20 percent of America’s electrical energy needs by 2030. The 248 page analysis (pdf) from the DOE says that even though such a feat will require massive industry growth (16,000 megawatts per year by 2018, sustained from then through 2030) the technical hurdles can all be overcome. For the alarmists that claim rising to the challenge of climate change with an aggressive approach toward renewable energy would devastate the economy, consider what happens with “massive industrial growth” – jobs. Lot’s of ‘em. Up to half a million according to the report. 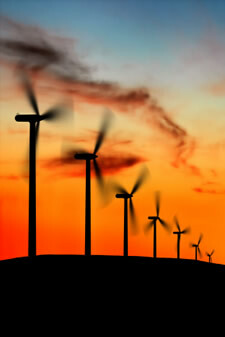 I wonder which investment – the war in Iraq or development of wind and other alternative sources of energy – will make America safer, provide more jobs, create sustainable economic growth, reduce our dependence on energy sources in unstable regions of the world, and lead to a significant reduction in greenhouse gas emissions. It’s a matter of priorities I guess.